Posted on December 19, 2014 at 1:23 pm. Big online pokies winners do exist and in no game is this truer than Microgaming’s Mega Moolah. This famous online, mobile and tablet progressive pokies game is building and building, ready to crown its next lucky winner, with a Mega Jackpot growing closer to the $3,000,000 mark as we speak, just in time for Christmas festivities. This progressive jackpot video slots game has produced some winners of epic proportions, most notably in 2009 when the biggest Mega Moolah winner tried their luck at a five Euro spin and came out a multi-millionaire victor. A Greek gentleman by the name of Georgios M won €6,374,599 ($9,572,735 AUD), making him the happiest man in Mega Moolah history. But he’s not alone in basking in his online pokies glory, with recent winners also taking out Mega Moolah’s Mega Jackpot: €2,384,388 in June 2014, $1,665,528 in December 2013, £1,898,527 in November 2013, and £1,649,686 in October 2013. Australian players keen for that sweet victory, and keen to win back some of their Christmas expenditure, can head to any of our recommended online casinos to be in the running for this record breaking win. Following an African theme, this popular pokies game is as fun to play as it is tempting to win. In true Microgaming style, the graphics are crystal clear, with reels made up of African wildlife and bright playing card symbols. The easy format makes it a simple, no-nonsense video slot game to play whether you are a pokies fanatic or first time player. Minimum bets start at $0.25 which is enough to trigger the four-tier jackpot bonus round (wheel of fortune style gameplay) as long as all lines are in play, however betting larger does increase your chances of activating the bonus wheel. The maximum bet is $6.25, so it’s not extraordinary high, either. 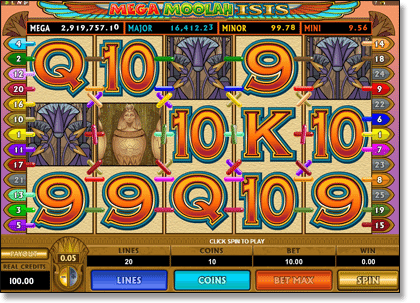 Mega Moolah Isis, the Ancient Egypt-themed counterpart to Mega Moolah – also holds the same increasing jackpots and operates in a similar fashion to Mega Moolah – you can play this pokie at any of our endorsed gambling sites. 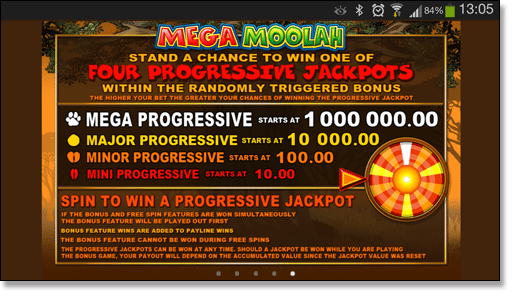 To be in the running for jackpot prizes, the Mega Moolah Jackpot bonus round is triggered at random any time all lines are being played. If the bonus round is activated, you are taken to a new level presenting a lucky wheel with four different coloured segments, each which represents a different jackpot prize. The mini jackpot starts out at a minimum of $10, the minor jackpot at $100, the major jackpot at $10K and the mega jackpot at a cool one million dollar starter, which is now dollars away from three million. The popularity of Mega Moolah means these jackpots are constantly on the rise, with players’ bets constantly contributing to the prize pool across all casino sites where this game is available. Mega Moolah is fully mobile optimised, making it a great game to play on the go. Compatible over a range of devices including the iPhone, iPad, Android, Blackberry, Windows Phone and other smartphones and tablets, the jackpots remain the same whether you are playing the mobile or desktop version. The biggest win while playing mobile Mega Moolah went to a fortunate player named Gabriel, who scored a gigantic £3.7 million using what just may be the luckiest smartphone ever. Imagine seeing that jackpot come up on your phone on the bus to work, or while spinning the reels in front of the TV during commercial breaks. Playing mobile pokies like Mega Moolah opens the doors to potentially life changing wins from anywhere you can secure an Internet connection. Sign up at Casino-Mate on your mobile and start playing. We’re not sure how high Mega Moolah’s jackpot will go this time around, but we’d love to see it taken out by an Aussie player, so get spinning and cross your fingers for a Christmas miracle that will make the festive season a whole lot merrier. Join in the Moolah action and enjoy the peace of mind knowing that playing for real Australian currency at any of these trusted pokies sites is 100% legal. Our recommended sites each adhere to strict rules within the online casino industry and support responsible gambling practices, making them the perfect worry-free gaming sites for Aussies to give the Mega Moolah jackpot a crack.